This was the first January in a long time that I didn't have a new years resolution to exercise more because for the last year I've exercised 5-7 days a week. What has motivated me through the year is my husband Kevin. Once he decided to take better care of his health and get in shape, it helped me so much as we now work out together. I've always exercised but walking was my exercise of choice. Kevin loved running until a few years ago when his knees started to hurt. He started an online exercise group and was doing it daily while I was still walking on our treadmill. He would always suggest I join him. "No thanks" was my reply, I was just fine walking off my calories. After 3 months of Kevin saying how much he loved his new exercise routine, his weight loss of 15 pounds and how good he felt, I decided I would give it a try. I tried it and I fell in love! Love is a strong word about exercise but I'm loving how I feel with more energy and strength. I also took off a few pounds! The name of the online exercise group in called Daily Burn 365. Daily Burn is a 30 minute workouts each day. It airs live at 9:00 am Eastern Time. So for us, central time, we usually work out at 7:00 am so we do the recorded show the day before. So whenever you like to exercise, you can, there is an episode ready 24 hours a day. Each day is a different trainer with a different full body workout. All you need is a yoga mat. Sometimes, there are exercises where you can use weights but only if you want. Kevin will use weights but I don't. The workouts are hard enough for me! I'll admit, I have my favorite trainers but what I like is each trainer has their own spin and I'm never bored. The workouts are designed for everyone. If you're starting out there are modification to met you at your fitness level. After a year of doing Daily Burn, I've come a long way but I still do the modifications. It has helped me move better, feel better, have better balance and feel stronger. What I personally love about Daily Burn is I can exercise in the privacy of my home. I've never enjoyed going to a gym, exercising in front of people is not my thing. 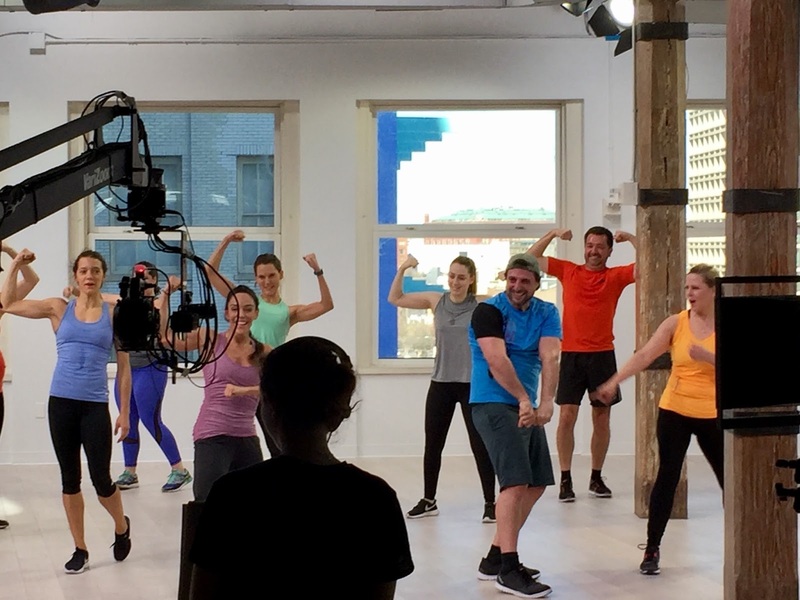 Last February, we were in New York City where the Daily Burn Studio is, and Kevin got to work out live. 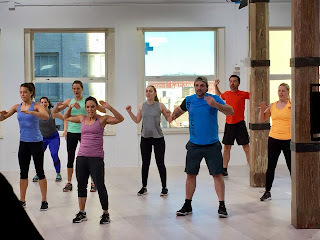 They encourage members to come to the studio and work out. I watched from behind the cameras (like I said, exercising in front of people and cameras, no thanks)! I'm uncoordinated and when the trainer is going right I'm usually going left. We had a lot fun meeting everyone, Kevin working out live and me, so proud of him, watching behind the scenes. A 30 day free trial is available to try and see if it's for you. The basic subscription cost $14.95/month. You access Daily Burn with WiFi and can be streamed to your TV, computer, and ipod. Daily Burn has been such a positive in my life I just have to share, check it out here. Daily Burn Studio in NYC. Kevin's in back with the orange shirt. Our goal is to try Daily Burn this year. We better get going since it's already the 18th of January. I like the idea of taping it. Thanks for the reminder!! Thanks! Once you start I'm sure you'll love it as much as we do. It's runs 24/7, a new 30 minute workout each day so whenever you want to exercise it's there for you.